The 66-year-old was in charge of Les Bleus when they controversially progressed to the 2010 World Cup at Ireland’s expense. Domenech ahead of the World Cup play-off against Ireland in 2009. IRELAND FANS WILL remember the name Raymond Domenech. The eccentric coach managed his native France between 2004-2010, and came up against the Boys in Green in two World Cup qualifying campaigns. In 2006, Les Bleus reached the final before losing out to Italy after Zinedine Zidane’s headbutt on Marco Materazzi. Four years later, after Thierry Henry’s handball had controversially helped them knock Ireland out of the play-offs, the French team finished bottom of their group and the players staged a revolt during the tournament. As President of the National Union of French Coaches (UNECATEF), the 66-year-old is visiting Derry this week, where he undertook training sessions at the Brandywell Stadium yesterday. Speaking to the Derry Journal, Domenech recalled being a three-man shortlist for the Republic of Ireland job before Brian Kerr was handed the role in 2003. He then added that he would be keen to take up the challenge in the future. “I have a long past with the Irish national team,” the ex-Lyon boss said. “I was contacted before I took the French national team job by the Irish Federation and they chose Brian Kerr which was a good choice. I was very interested then and I’m still interested because I like the spirit of Irish. I remember when we won in Ireland in 2005 after the game I had to go to the media and it was near the stands. I had to cross in front of all the spectators. In France they would never do that because you never know what would happen. “But the Irish were all shaking my hand. They had respect and they are fighters so I like the spirit. I saw that in Paris some years after. But I like that. Email “Ex-France boss Raymond Domenech says he's interested in managing Ireland”. 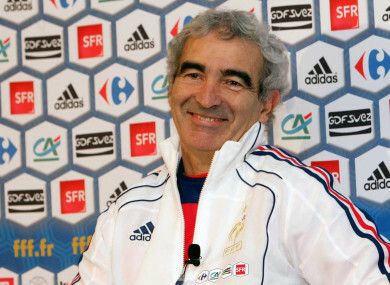 Feedback on “Ex-France boss Raymond Domenech says he's interested in managing Ireland”.